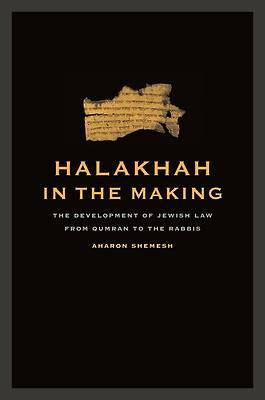 Halakhah in the Making offers the first comprehensive study of the legal material found in the Dead Sea Scrolls and its significance in the greater history of Jewish religious law (halakhah). Aharon Shemesh's pioneering study revives an issue long dormant in religious scholarship: namely, the relationship between rabbinic law, as written more than one hundred years after the destruction of the Second Temple, and Jewish practice during the Second Temple. The monumental discovery of the Dead Sea Scrolls in Qumran led to the revelation of this missing material and the closing of a two-hundred-year gap in knowledge, allowing work to begin comparing specific laws of the Qumran sect with rabbinic laws. With the publication of scroll 4QMMT-a polemical letter by Dead Sea sectarians concerning points of Jewish law-an effective comparison was finally possible. This is the first book-length treatment of the material to appear since the publication of 4QMMT and the first attempt to apply its discoveries to the work of nineteenth-century scholars. It is also the first work on this important topic written in plain language and accessible to nonspecialists in the history of Jewish law.